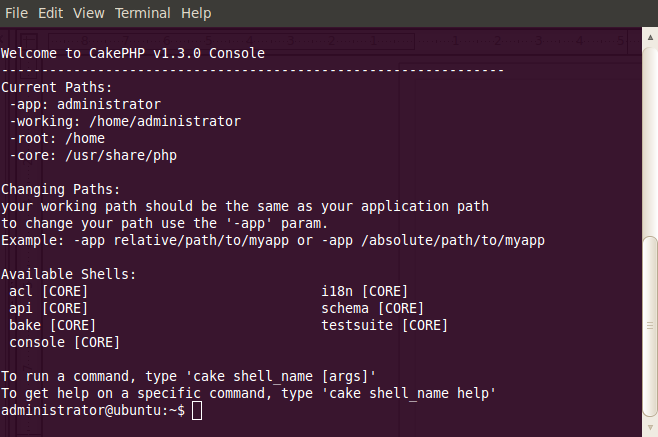 It’s very easy to install the new update of the cakePHP framework on Ubuntu. 2. Extract it in to administrator directory (it is the easiest for a beginner) – rename and make it’s path like /home/administrator/cake. then you will have all the stuff coming with the cakePHP bundle. 3. Make a directory on following path by using the command by running a terminal, if it ask for the password give it. 5. Now you will see that in the /usr/share/php/cake directory will having some files. Thats all now you can bake your new cake. For future updates just do above steps. This entry was posted in cakePHP, Ubuntu. and it should work well. That way, if you update cake and the shell changes, you’ll be fine.